An extraordinarily large-scale landslide with a volume of about 200 million m3, a width of about 1,600 m, and a height of about 750 m occurred on 2004 March 26, 13:45 local time, on a steep caldera wall on the northwest flank of Mt. Bawakaraeng (2,830 m) at the headwater of the Jeneberang River in South Sulawesi, Indonesia. The debris avalanche extended about 7 km from the headwater and buried the river valley, causing devastating damage. There are a great many calderas in the world, notably Japan. If a large-scale sector collapse were to occur in a heavily populated area, it would be a devastating disaster for the people living in the area. The aim of this paper is to outline such a landslide and explain its mechanism of occurrence. We evaluated the stability of the original slope before the landslide using the limit equilibrium method and the finite-element-based shear strength reduction method (SSRFEM) with the strength reduction factor. The limit equilibrium method showed that a rise in the groundwater level caused the landslide. Although the critical slip surface predicted by the SSRFEM was shallower than that of the actual slip surface, the end positions of the actual and predicted slip surfaces were almost the same. Moreover, the end position of the critical slip surface before the landslide—the headwater of the Jeneberang River—was a knick point at which the slope inclination became steeper. 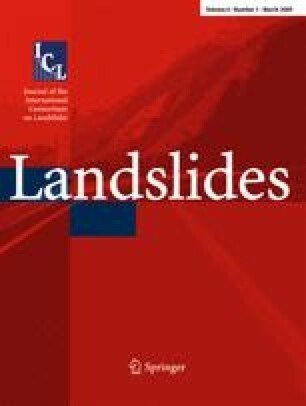 SSRFEM analysis may be useful for evaluating the slope stability of large-scale landslides, because the critical slip surface predicted by it was close to the actual surface, even though we assumed homogenous conditions without information on the degree of weathering or ground properties. As the knick point formed at the end of the critical slip surface and is equivalent to the end of the actual slip surface, we assume such topographic features to be a primary geomorphologic cause of the landslide. We conducted the site investigation as a JICA Sabo urgent investigation during 2004 June 20 to 29. We would like to acknowledge JICA (Japan International Corporation Agency) for providing us with this opportunity, and are grateful for the cooperation and help extended to us by the NGO, Komunitas Sabo. In particular, we would like to thank Dr. Agnes (Hasunudin University, Makassar) for assistance in the site investigation. This study was supported by a grant-in-aid for research from the Ministry of Education, Culture, Sports, Science and Technology of Japan (Project No. 1740503).